Up and Out is Christian Marclay’s feature length video collage in which Michelangelo Antonioni’s 1966 masterpiece Blow Up is overlaid with the soundtrack of Brian De Palma’s 1981 thriller Blow Out. The images and soundtrack make a beautiful pairing, not least because of the fate shared by the films’ protagonists. The photographer in Blow Up (played by David Hemmings) and the sound-effects specialist in Blow Out (played by John Travolta) both have forensic roles, as do the viewers of Up and Out who are forced to rely on their wits to piece the images and sounds together. Up and Out, Dir. 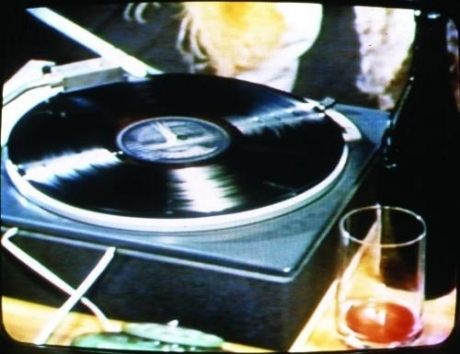 Christian Marclay, 1998, 107 mins. Christian Marclay is a Swiss and American visual artist and composer. His work explores connections between sound, noise, photography, video, and film. Since the 1970s he pioneered the use of gramophone records and turntables as musical instruments to create sound collages. His artwork has been exhibited in museums internationally, including: Paula Cooper Gallery, New York; Whitney Museum, New York; Kunsthaus, Zurich; Venice Biennale; The Clocktower, PS1, New York; and Hirshhorn Museum, Washington. He has performed and recorded both solo and in collaboration with many musicians, including John Zorn, Elliott Sharp, Otomo Yoshihide and Shelley Hirsch. Curated by AV Festival 10. Courtesy the artist and White Cube, London. Regional Premiere.